Historically, the business has raised capital to invest in UK property from the oil-rich Gulf states, including Saudi Arabia, the UAE, Bahrain and Qatar. However, in the wake of the crisis in Syria and instability elsewhere in the region, JR Capital is targeting the Levant region for the first time. It is looking to raise £100m from Jordan, Lebanon, Syria and Egypt. To spearhead the capital-raising drive, JR Capital has recruited Neena Shah, who was head of the Middle East and Levant at the Royal Bank of Canada, as managing director. 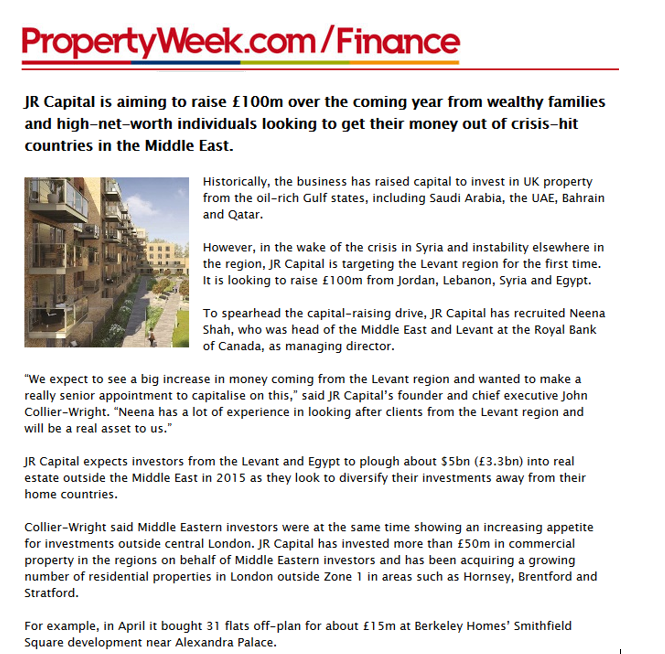 JR Capital expects investors from the Levant and Egypt to plough about $5bn (£3.3bn) into real estate outside the Middle East in 2015 as they look to diversify their investments away from their home countries. Collier-Wright said Middle Eastern investors were at the same time showing an increasing appetite for investments outside central London. JR Capital has invested more than £50m in commercial property in the regions on behalf of Middle Eastern investors and has been acquiring a growing number of residential properties in London outside Zone 1 in areas such as Hornsey, Brentford and Stratford. For example, in April it bought 31 flats off-plan for about £15m at Berkeley Homes’ Smithfield Square development near Alexandra Palace.